Sometimes I have these dreams of opening a restaurant that’s only open for breakfast and happy hour. I would make awesome breakfast/brunch dishes and cocktails. The place would be called The Before and After. Then I wakeup and remember how much I would absolutely hate my life if I ran a restaurant. But if The Before and After was a real place… I would sell these for $3 a piece. Or $7 for three obviously. 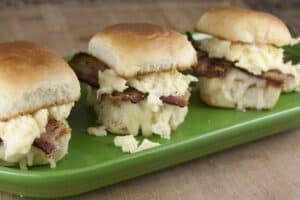 Bacon, eggs, and cheese stuffed into a small slider roll makes for a fun and tasty breakfast dish. 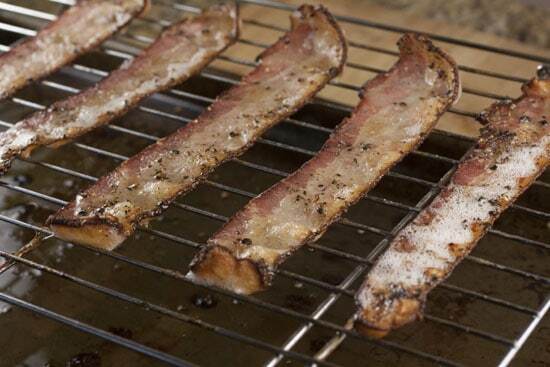 1) Bake bacon on a wire rack over a baking sheet at 350 degrees for 15-20 minutes until bacon is very crispy. 2) Whisk eggs with cream and cook on medium heat until fluffy, about 4-5 minutes. 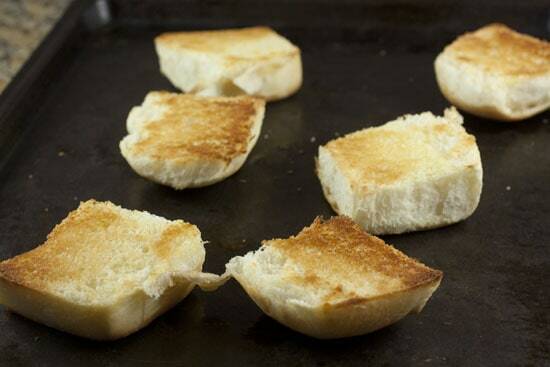 3) Cut open rolls and toast them in a 350 degree oven until they are nicely browned, about 3 minutes. 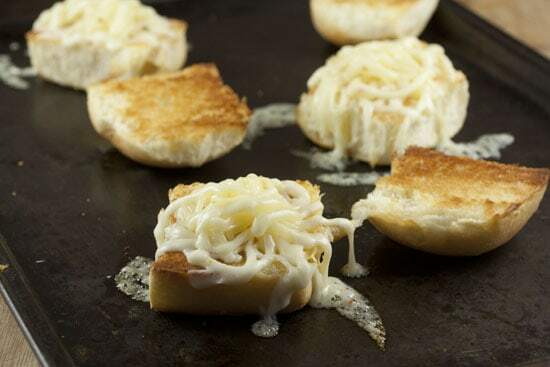 4) Add grated cheese to one side of each roll and return to oven for another minute. 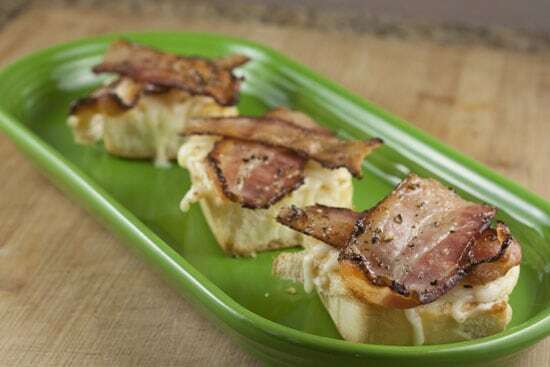 5) Add bacon and eggs and serve immediately! 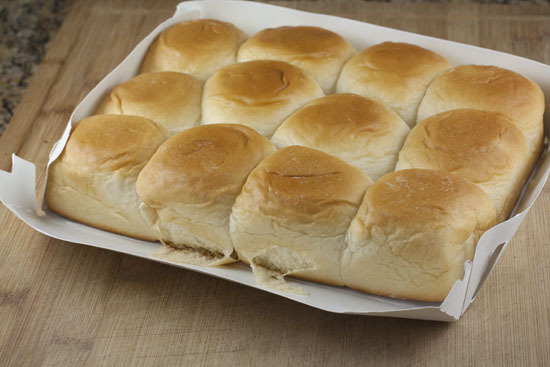 When it comes to slider rolls, it’s hard to beat the soft rolls that come in packs of twelve in the deli section of most grocery stores. You could make your own definitely, but these are just so tasty and easy, I just use them. I have a strange addiction to these things. I didn’t want to get too fancy with these sliders. That doesn’t mean you couldn’t. You could put almost anything that goes well with scrambled eggs in with these sandwiches. For me though, on this day, bacon and some cheese is all that I wanted. If you were at The Before and After, this would be called The Original. If you’ve been a Macheesmo reader for a while, you’ll know that I really only cook bacon one way. I lay it out on a wire rack over a baking sheet and bake it at 350 degrees for about 15-20 minutes. This makes perfectly crispy bacon that stays in really nice strips which is great for stuff like sandwiches. The only way to do bacon! 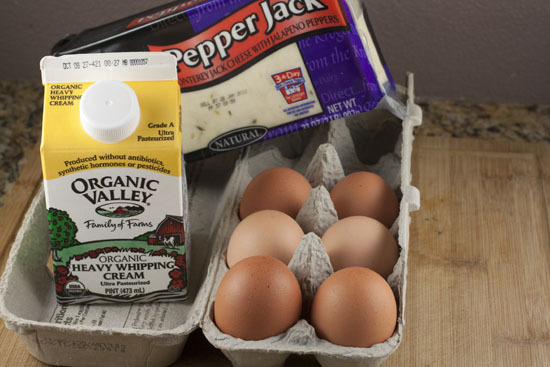 For preparing the eggs, just whisk together the eggs with the cream. 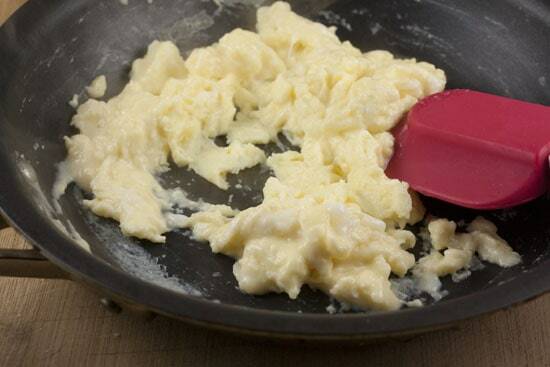 Add the eggs to a small nonstick pan over medium heat and stir the eggs as they start to cook. After five or six minutes, they should be light and fluffy. Try not to cook them rock hard. They will keep cooking for a minute after you kill the heat. Whatever breakfast stuff you want to shove in your slider, the most important part is toasting the little buns. Just cut them open and lay them cut side down on a baking sheet. Bake them at 350 degrees for about 3-4 minutes and they should get perfectly toasted. Then pile your grated cheese on one half of each slider bun. Return the tray to the oven for another minute just to melt the cheese a bit. Then stack on your bacon! One strip per slider is perfect. Add a heap of scrambled eggs and put the top on the slider and you’re ready to go. I don’t know why it is that sliders are somehow tastier than a full sandwich. But it’s true. Or, if you happen to open or work in a brunch restaurant, stick these suckers on the menu. People will be busting down the doors. 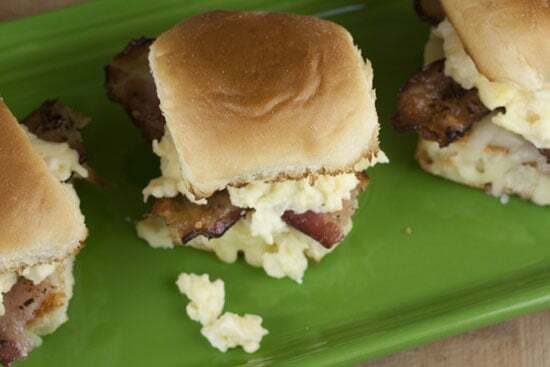 I have to admit that I've never thought of sliders for breakfast but those look delish! As someone who has long been a connoisseur of the breakfast sandwich I'd recommend buttering and grilling the rolls instead of toasting them; it takes a little more effort but the buttery crust just takes it to the next level. Nick, you Rock! My husband is gonna love these! I usually put my buns under the toaster oven broiler for a minute when I make hamburgers. I have never put bacon in the oven before, but it makes total sense the way you do these! The oven would already be hot from the bacon, so in go the buns, cheese, and Wow! Very efficient! I have been thinking of making sliders lately, because the tiny buns might be less calories, and they are very appealing in their small size. These are inspirational. i have those same dreams nick. mine is just breakfast; all kicked up entrees. a place guy fieri would cry in. Mmmm…these look awesome. I'm always looking for something my boys'll eat in the mornings, and sometimes we're all running late and it's a long ride to school. Think these'll freeze well? If so, I may just make a couple dozen and keep them handy for mornings when I just PLAN to run late so they can get a little extra shut-eye and then have something scrumptious to eat in the car. :) Thanks for sharing! like your blog its really, and i mean really helpful when your pretty new in a kitchen like myself. i have a question, it does ot have anyhing to do wiht post, but i dont know else where to ask. Of all the foodies, you must know :D. Sometimes you just have to use hot oil. but it’s actually because i want to make a fancy dinner for my famliy, where I want to severe a stater where I make a homemade aioli. what would you suggest to eat with aioli? IF you want to check out the concept, there's a restaraunt in Denver called Snooze AM that just does breakfast and Brunch. No happy, hour, but given your experiments I think you'd love it. It's out on 6th or 8th and Colorado Blvd. You should Check it out. I still remember a barbecue brisket benedict on black beans with a polenta base. Was amazing. Those look awesome! I have to remember this way of cooking bacon. I'm glad you gave a reminder. I'm afraid I'd forget about it and char it, but it would be nice to free up some space on the stove top. I also love the fact that you have a restaurant concept in your mind, but you know you'd hate your life if you did it. Everyone who likes to cook must have these daydreams. If I had mine, it would be a General Store with a lunch counter, and it would only be open from 11-3 because I can't give up my evenings and I'm not a morning person. Guess I better not quit my day job. I work in the kitchen of a cinema restaurant and we only serve breakfast one day a week, but I started making exactly these sliders like a week ago for staff breakfasts on weekdays. So good, especially with a little of our chipotle mayo on the bun! I was so excited to see that you had the same idea that I did. Thanks for the bacon tip, Nick! I used it this morning to make bacon, egg, and cheese muffins for the family breakfast. I ended up having to broil mine to get it a bit more crispy though….